"Battle Tank" redirects here. For the video game, see Battle Tank (video game). Israel Defense Forces Merkava Mk 4M with Trophy (Windbreaker) active protection system, 2016. A main battle tank (MBT), also known as a battle tank or universal tank, is a tank that fills the armor-protected direct fire and maneuver role of many modern armies. Cold War era development of more powerful engines, better suspension systems and lightweight composite armour allowed a tank to have the firepower of a super-heavy tank, armor protection of a heavy tank, and mobility of a light tank all in a package with the weight of a medium tank. Through the 1960s, the MBT replaced almost all other tanks, leaving only some specialist roles to be filled by lighter designs or other types of armoured fighting vehicles. Today, main battle tanks are considered a key component of modern armies. Modern MBTs seldom operate alone, as they are organized into armoured units which involve the support of infantry, who may accompany the MBTs in infantry fighting vehicles. They are also often supported by surveillance or ground-attack aircraft. In World War I, tanks were classed into light, medium, and heavy based on weight, and its impact on speed and mobility. As tank combat evolved, tank design suffered from a number of limitations due largely to engine power and transmission capability. A designer could produce a tank with high maneuverability, armour, or a large gun, but generally not all three at the same time. Combined with inter-war tank theory which stressed high-speed dashes into the rear of the enemy's lines, these limitations led naturally to two classes of tank that continued through much of World War II. The first prioritised maneuverability, and thus had a limit on weight. These were known variously as cavalry tanks, light tanks, medium tanks, cruiser tanks or even tankettes for the very smallest versions. These tanks had different uses depending on the country's tank doctrine, but were generally used to exploit holes in the enemy lines and run far into the rear areas in self-supporting armoured groups. This would disrupt enemy logistics and command-and-control, as well as delay the movement of reserves to the front. It was believed operations of this sort would undermine or completely destroy the ability for the front-line troops to continue battle. The second class prioritised armour and thus weighed more, limiting maneuverability. These were known as infantry tanks, heavy tanks, or assault tanks. They were generally designed to assault enemy lines, working in concert with front-line infantry. As these were expected to move forward at the same speed as the men, higher speeds were not required and the engine power could instead be used to carry a much greater load. Infantry tanks featured much larger amounts of armour, heavier guns, and more track area to allow them to cross a shell-riddled battlefield. As the nature of tank warfare evolved, tanks designed for other specialised roles also saw development. This included dedicated tank destroyers, and engineer tanks such as Hobart's Funnies. Tank destroyers had varied successes, and often ended up engaging enemy infantry instead of their intended targets. German assault gun armoured vehicles like the Sturmgeschütz III were found effective in an anti-tank role. In spite of a great amount of theory and pre-war testing, the plans for armoured combat quickly proved themselves outdated. The battlefield did not bog down like it did in World War I and tended to be much more mobile. This was especially evident in the great sweeping battles in North Africa and the Soviet Union, where armoured forces executed drives of hundreds of miles. In these cases the problems with having two designs became especially evident; the tanks able to go toe-to-toe with the enemy were generally found miles to the rear, trying to catch up. Those able to maintain the drive were lightly armoured, and proved easy prey for enemy anti-tank guns and rifles. In response to this new threat, light tanks were generally consigned to the reconnaissance role, while medium tanks were developed with improved armour, able to defeat anti-tank rifles and most smaller guns while retaining a reasonable level of mobility. As these evolved, the tank's own weapons had to grow larger in order to deal with enemy tanks with the same level of armour. This evolution led to the development of a more general-purpose medium tank, which dominated combat in the second half of the war. Medium tanks formed the bulk of the tank combat forces. Generally these designs massed about 25-30 tonnes, were armed with cannons around 75 mm, and powered by engines in the 400 to 500 hp range. Notable examples include the Soviet T-34 (the most-produced tank to that time), the German Panzer IV, and the US M4 Sherman. The widespread production of these designs led to most others being pushed out of service or into niche roles, often competing on numbers rather than armour. The rapid increase in engine power in the aviation world had trickle-down effects to tank development. In Britain, tank development had continued down the parallel development of cruiser tanks and infantry tanks, light tanks having been dropped in favour of other reconnaissance vehicles. Development of the Rolls-Royce Meteor engine for the Cromwell tank, combined with efficiency savings elsewhere in the design, almost doubled the available horsepower for cruiser tanks. This increase led to speculation of a universal tank, able to take on the role of both cruiser and infantry tank with both armour and maneuverability. Design of a universal tank commenced, but was ultimately overtaken by events. Continued development of the basic Cromwell design led eventually to the Centurion. This design's armour was able to defeat all small and medium anti-tank guns, enabling the cruiser tank to take on an infantry tank role as well. The tank also mounted a gun able to defeat even the largest enemy tanks, and offered greater manoeuvrability than most earlier light, medium, and cruiser tank designs. Development of the universal tank ceased, and Centurion entered service just as World War II finished, becoming a multi-role vehicle forming the main battle tank force of the British army (and other nations through export). This paved the way for a new tank classification, the main battle tank, and Centurion is considered by many to be the first MBT. A surplus of effective WWII-era designs in other forces, notably the US and Soviet Union, led to slower introductions of similar designs on their part. By the early 1950s these designs were clearly no longer competitive, especially in a world of shaped charge weapons, and new designs rapidly emerged from most armed forces. The concept of the medium tank gradually evolved into the MBT in the 1960s, as it was realized that medium tanks could carry guns (such as the US 90 mm, Soviet 100 mm, and especially the British L7 105 mm) that could penetrate any practical level of armour at long range. Also, the heaviest tanks were unable to use most existing bridges. The World War II concept of heavy tanks, armed with the most powerful guns and heaviest armour, became obsolete because the large tanks were too expensive and just as vulnerable to damage by mines, bombs, rockets and artillery. Likewise, World War II had shown that lightly armed and armoured tanks were of limited value in most roles. Even reconnaissance vehicles had shown a trend towards heavier weight and greater firepower during World War II; speed was not a substitute for armour and firepower. An increasing variety of anti-tank weapons and the perceived threat of a nuclear war prioritized the need for additional armour. The additional armour prompted the design of even more powerful guns. The main battle tank thus took on the role the British had once called the "universal tank", exemplified by the Centurion, filling almost all battlefield roles. Typical main battle tanks were as well armed as any other vehicle on the battlefield, highly mobile, and well armoured. Yet they were cheap enough to be built in large numbers. The first Soviet main battle tank was the T-64 (the T-54/55 and T-62 were considered "medium" tanks) and the first American nomenclature-designated MBT was the M60 Patton. A very early model M60 "Patton" with M48 turret and 105mm cannon. Anti-tank weapons rapidly outpaced armour developments. By the 1960s anti-tank rounds could penetrate a meter of steel so as to make the application of traditional rolled homogeneous armour unpragmatic. The first solution to this problem was the British Chobham armour. This composite armour utilized layers of ceramics and other materials to help attenuate the effects of high-explosive anti-tank (HEAT) munitions. Another threat came by way of the widespread use of helicopters in battle. Before the advent of helicopters, armour was heavily concentrated to the front of the tank. This new threat caused designs to distribute armour on all sides of the tank (also having the effect of protecting the vehicle's occupants from nuclear explosion radiation). By the late 1970s, MBTs were manufactured by China, France, West Germany, Britain, India, Italy, Japan, the Soviet Union, Sweden, Switzerland, and the United States. The Soviet Union's war doctrine depended heavily on the main battle tank. Any weapon advancement making the MBT obsolete could have devastated the Soviet Union's fighting capability. The Soviet Union made novel advancements to the weapon systems including mechanical autoloaders and anti-tank guided missiles. Autoloaders were introduced to replace the human loader, permitting the turret to be reduced in size, making the target smaller and less visible, while missile systems were added to extend the range at which a vehicle could engage a target and thereby enhance the first-round hit probability. The United States's experience in the Vietnam War contributed to the idea among army leadership that the role of the main battle tank could be fulfilled by attack helicopters. During the Vietnam War, helicopters and missiles competed with MBTs for research money. Though the Persian Gulf War reaffirmed the role of main battle tanks, MBTs were outperformed by the attack helicopter. Other strategists considered that the MBT was entirely obsolete in the light of the efficacy and speed with which coalition forces neutralized Iraqi armour. A German Leopard 2 in the PSO-version, prepared for asymmetrical warfare. In asymmetric warfare, threats such as improvised explosive devices and mines have proven effective against MBTs. In response, nations that face asymmetric warfare, such as Israel, are reducing the size of their tank fleet and procuring more advanced models. The United States Army used 1,100 M1 Abrams in the course of the Iraq War. They proved to have an unexpectedly high vulnerability to improvised explosive devices. A relatively new type of remotely detonated mine, the explosively formed penetrator, was used with some success against American armoured vehicles. However, with upgrades to their rear armour, M1s proved to be valuable in urban combat; at the Second Battle of Fallujah the United States Marines brought in two extra companies of M1s. Britain deployed its Challenger 2 tanks to support its operations in southern Iraq. Advanced armour has not improved vehicle survivability, but has reduced crew fatalities. Small unmanned turrets on top of the cupolas called remote weapon stations armed with machine guns or mortars provide improved defence and enhance crew survivability. Experimental tanks with unmanned turrets locate crew members in the heavily armoured hull, improving survivability and reducing the vehicle's profile. Technology is reducing the weight and size of the modern MBT. A British military document from 2001 indicated that the British Army would not procure a replacement for the Challenger 2 because of a lack of conventional warfare threats in the foreseeable future. The obsolescence of the tank has been asserted, but the history of the late 20th and early 21st century suggested that MBTs were still necessary. Main battle tanks remain a useful tool for internal security. Nations (such as Japan, Bangladesh and Indonesia) lacking expeditionary ambitions, or even credible land-based threats from abroad, are bolstering their ground forces with MBTs for the express purpose of maintaining internal security. 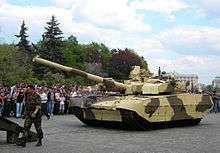 A main battle tank has been officially described by the Organization for Security and Co-operation in Europe as "a self-propelled armoured fighting vehicle, capable of heavy firepower, primarily of a high muzzle velocity direct fire main gun necessary to engage armoured and other targets, with high cross-country mobility, with a high level of self-protection, and which is not designed and equipped primarily to transport combat troops." 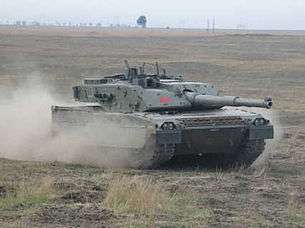 The Challenger 2 is equipped with Dorchester armour, an advanced composite armour. Originally, most MBTs relied on steel armour to defend against various threats. As newer threats emerged, however, the defensive systems used by MBTs had to evolve to counter them. One of the first new developments was the use of explosive reactive armour (ERA), developed by Israel in the early 1980s to defend against the shaped-charge warheads of modern anti-tank guided missiles and other such high-explosive anti-tank (HEAT) projectiles. This technology was subsequently adopted and expanded upon by the United States and the Soviet Union. MBT armour is concentrated at the front of the tank, where it is layered up to 33 centimetres (13 in) thick. 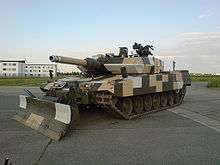 The Indian T-90 Bhishma has a two-tier protection system. The Russian T-14 Armata has a three-tier protection system, with the Afghanit APS, the Malachit ERA, and composite armour. Missiles are cheap and cost-effective anti-tank weapons. ERA can be quickly added to vehicles to increase their survivability. However, the detonation of ERA blocks creates a hazard to any supporting infantry near the tank. Despite this drawback, it is still employed on many Russian MBTs, the latest generation Kontakt-5 being capable of defeating both HEAT and kinetic energy penetrator threats. The Soviets also developed Active Protection Systems (APS) designed to more actively neutralize hostile projectiles before they could even strike the tank, namely the Shtora and Arena systems. The United States has also adopted similar technologies in the form of the Missile Countermeasure Device and as part of the Tank Urban Survival Kit used on M1 Abrams tanks serving in Iraq. The latest Russian MBT, the T-14 Armata, incorporates an AESA radar as part of its Afghanit APS and in conjunction with the rest of its armament, can also intercept aircraft and missiles. MBTs can also be protected from radar detection by incorporating stealth technology. The T-14 Armata has a turret designed to be harder to detect with radars and thermal sights. Advanced camouflage, like the Russian Nakidka, will also reduce the radar and thermal signatures of a MBT. The use of electric engines, such as the ones being considered for use on the Turkish Altay, can also reduce the thermal signature of the tank. Other defensive developments focused on improving the strength of the armour itself; one of the notable advancement coming from the British with the development of Chobham armour in the 1970s. It was first employed on the American M1 Abrams and later the British Challenger 1. Chobham armour uses a lattice of composite and ceramic materials along with metal alloys to defeat incoming threats, and proved highly effective in the conflicts in Iraq in the early 1990s and 2000s; surviving numerous impacts from 1950–60s–era rocket-propelled grenades with negligible damage. It is much less efficient against later models of RPGs. For example, the RPG-29 from the 1980s is able to penetrate the frontal hull armour of the Challenger 2. 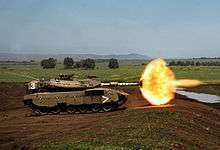 Merkava Mk 3d BAZ of the Israel Defense Forces firing its main gun. Main battle tanks are equipped with a main tank gun, and at least one machine gun. MBT main guns are generally between 90 and 130 mm caliber, and can fire both anti-armour and, more recently, anti-personnel rounds. The cannon serves a dual role, able to engage other armoured targets such as tanks and fortifications, and soft targets such as light vehicles and infantry. It is fixed to the turret, along with the loading and fire mechanism. Modern tanks utilize a sophisticated fire-control system, including rangefinders, computerized fire control, and stabilizers, which are designed to keep the cannon stable and aimed even if the hull is turning or shaking, making it easier for the operators to fire on the move and/or against moving targets. Gun-missile systems are complicated and have been particularly unsatisfactory to the United States who abandoned gun-missile projects such as the M60A2 and MBT-70, but have been diligently developed by the Soviet Union, who even retrofitted them to T-55 tanks, in an effort to double the effective range of the vehicle's fire. The MBT's role could be compromised because of the increasing distances involved and the increased reliance on indirect fire. The tank gun is still useful in urban combat for precisely delivering powerful fire while minimizing collateral damage. High explosive anti-tank (HEAT), and some form of high velocity kinetic energy penetrator, such as APFSDS (armour-piercing fin stabilized discarding sabot) rounds are carried for anti-armour purposes. Anti-personnel rounds such as high explosive or high explosive fragmentation have dual purpose. Less common rounds are Beehive anti-personnel rounds, and high explosive squash head (HESH) rounds used for both anti-armour and bunker busting. Usually, an MBT carries 30-50 rounds of ammunition for its main gun, usually split between HE, HEAT and kinetic energy penetrator rounds. Some MBTs may also carry smoke or white phosphorus rounds. 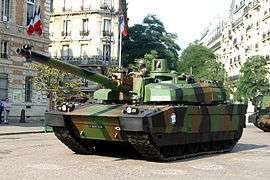 Some MBTs are equipped with an autoloader, such as the French Leclerc, or the Russian/Ukrainian T-64, T-72, T-80, T-84, T-90, and T-14 and, for this reason, the crew can be reduced to 3 members. MBTs with an autoloader require one less crew member and the autoloader requires less space than its human counterpart, allowing for a reduction in turret size. Further, an autoloader can be designed to handle rounds which would be too difficult for a human to load. This reduces the silhouette which improves the MBT's target profile. However, with a manual loader, the rounds can be isolated within a blowout chamber, rather than a magazine within the turret, which could improve crew survivability. However, the force of a modern depleted uranium armour piercing fin discarding sabot round at the muzzle can exceed 6000 kN (a rough estimate, considering a uranium 60 cm/2 cm rod, 19g/cm3, @ 1,750 m/s). Composite+reactive armour could withstand this kind of force through its deflection and deformation, but with a second hit in the same area, an armour breach is inevitable. As such, the speed of follow up shots is crucial within tank to tank combat. As secondary weapons, an MBT usually uses between two and four machine guns to engage infantry and light vehicles. Many MBTs mount one heavy caliber anti-aircraft machine gun (AAMG), usually of .50 caliber (like the M2 Browning or DShK), which can be used against helicopters and low flying aircraft. However, their effectiveness is limited in comparison to dedicated anti-aircraft artillery. The tank's machine guns are usually equipped with between 500 and 3000 rounds each. BM Oplot, produced by the KMDB guided onto a tank transporter. MBTs, like previous models of tanks, move on treads, which allow a decent level of mobility over most terrain including sand and mud. They also allow tanks to climb over most obstacles. MBTs can be made water-tight, so they can even dive into shallow water (5 m (16 ft) with snorkel). However, treads are not as fast as wheels; the maximum speed of a tank is about 65 km/h (40 mph) (72 km/h (45 mph) for the Leopard 2). The extreme weight of vehicles of this type (45-70 tons) also limits their speed. They are usually equipped with a 1,200–1,500 hp (890–1,120 kW) engine (more than 25,000 cc (1,526 cu in)), with an operational range near 500 km (310 mi). 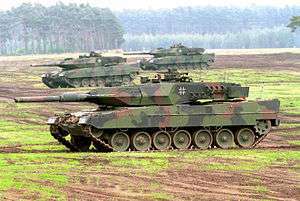 The German Army has prioritized mobility in its Leopard 2 which is considered the fastest MBT in existence. The Italian Ariete. Its relatively low weight (54 tonnes) facilitates mobility, especially while crossing bridges. The MBT is often cumbersome in traffic and frequently obstructs the normal flow of traffic. The tracks can damage some roads after repeated use. Many structures like bridges do not have the load capacity to support an MBT. In the fast pace of combat it is often impossible to test the sturdiness of these structures. In the 2003 invasion of Iraq, an M1 Abrams attempting to cross a bridge to evade enemy fire plummeted into the Euphrates river when the bridge collapsed. Though appreciated for its excellent off-road characteristics, the MBT can become immobilized in muddy conditions. The high cost of MBTs can be attributed in part to the high performance engine-transmission system and to the fire control system. Also, propulsion systems are not produced in high enough quantities to take advantage of economies of scale. Crew fatigue limits the operational range of MBTs in combat. Reducing the crew to three and relocating all crewmembers from the turret to the hull could provide time to sleep for one off-shift crewmember located in the rear of the hull. In this scenario, crewmembers would rotate shifts regularly and all would require cross-training on all vehicle job functions. Cargo aircraft are instrumental to the timely deployment of MBTs. The absence of sufficient numbers of strategic airlift assets can limit the rate of MBT deployments to the number of aircraft available. Military planners anticipate that the airlift capability for MBTs will not improve in the future. To date, no helicopter has the capability to lift MBTs. Rail and road are heavily used to move MBTs nearer to the battle, ready to fight in prime condition. Where well maintained roads allow it, wheeled tank transporters can be used. The difficult task of resupply is usually accomplished with large trucks. Main battle tanks have internal and external storage space. Internal space is reserved for ammunition. External space enhances independence of logistics and can accommodate extra fuel and some personal equipment of the crew. 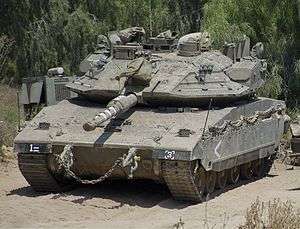 The Israeli Merkava can even accommodate crew members displaced from a destroyed vehicle in its ammunition compartment. Emphasis is placed on selecting and training main battle tank crew-members. The crew must perform their tasks faultlessly and harmoniously so commanders select teams taking into consideration personalities and talents. U.S. Marines during the Iraq War ride on an M1A1 Abrams tank in April 2003. The main battle tank fulfills the role the British had once called the "universal tank", filling almost all battlefield roles. They were originally designed in the Cold War to combat other MBTs. The modern light tank supplements the MBT in expeditionary roles and situations where all major threats have been neutralized and excess weight in armour and armament would only hinder mobility and cost more money to operate. Reconnaissance by MBTs is performed in high-intensity conflicts where reconnaissance by light vehicles would be insufficient due to the necessity to "fight" for information. In asymmetric warfare, main battle tanks are deployed in small, highly concentrated units. MBTs fire only at targets at close range and instead rely on external support such as unmanned aircraft for long range combat. Main battle tanks have significantly varied characteristics. Procuring too many varieties can place a burden on tactics, training, support and maintenance. The MBT has a positive morale effect on the infantry it accompanies. It also instills fear in the opposing force who can often hear and even feel their arrival. Mechanics at Anniston Army Depot line up an M1 Abrams turret with its hull. 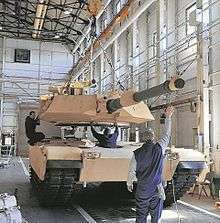 MBT production is increasingly being outsourced to wealthy nations. Countries that are just beginning to produce tanks are having difficulties remaining profitable in an industry that is increasingly becoming more expensive through sophistication of technology. Even some large-scale producers are seeing declines in production. Even China is divesting many of its MBTs. The production of main battle tanks is limited to manufacturers that specialize in combat vehicles. Commercial manufacturers of civilian vehicles cannot easily be repurposed as MBT production facilities. Prices for MBTs have more than tripled from 1943 to 2011, although this pales in comparison with the price increase in fighter aircraft from 1943 to 1975. Several MBT models, such as the AMX-40 and OF-40, were marketed almost solely as export vehicles. Several tank producers, such as Japan and Israel, choose not to market their creations for export. Others have export control laws in place. Wikimedia Commons has media related to Main battle tanks. Future Combat Vehicle(FVC), US Army's third attempt to replace the aging M2 Bradley. ↑ Tranquiler, Roger, Modern Warfare. A French View of Counterinsurgency, trans. Daniel Lee, Pitting a traditional combined armed force trained and equipped to defeat similar military organisations against insurgents reminds one of a pile driver attempting to crush a fly, indefatigably persisting in repeating its efforts. 1 2 3 Thomas W. Zarzecki (2002). Arms Diffusion: The Spread of Military Innovations in the International System. Psychology Press. p. 212. ISBN 0-415-93514-8. Retrieved 5 April 2011. ↑ MIL-T-45308 state "Tank, Main Battle, 105MM Gun, M60", while MIL-T-45148 state "TANK, COMBAT, FULL-TRACKED, 90MM GUN, M48A2"
↑ AcademicJohn Harris & Andre Gsponer (1986). Armour defuses the neutron bomb. Reed Business Information. p. 47. Retrieved 29 July 2011. ↑ Academic American encyclopedia, Volume 2. Aretê Pub. Co., 1980. 1980. p. 177. Retrieved 4 April 2011. ↑ David C. Isby (1988). Weapons and tactics of the Soviet Army. Jane's. Retrieved 4 April 2011. ↑ Daniel H. Else (III.) (2008). "Chapter 3". Bias in weapon development. ProQuest. p. 62. Retrieved 12 March 2012. ↑ Canadian Institute of Strategic Studies (1993). The Canadian strategic forecast. Canadian Institute of Strategic Studies. p. 73. Retrieved 4 April 2011. 1 2 3 4 5 6 Chris McNab; Hunter Keeter (2008). Tools of violence: guns, tanks and dirty bombs. Osprey Publishing. Retrieved 6 April 2011. 1 2 Panda, Ankit (13 January 2015). "Main Battle Tanks in Asia: Useful Junk". Retrieved 21 July 2015. Beyond Asia’s large militaries, the broader proliferation of tanks makes sense given the security needs of states with relatively weaker militaries. Naval and amphibious warfare focused states such as Japan and Indonesia are acquiring new tanks to build capacity in land warfare (urban warfare in Japan's case). Bangladesh, as a developing nation, is acquiring cheaper Chinese MBTs for similar reasons. None of these states expect to use these tanks for an expeditionary purpose, or even against a foreign invader. MBTs can play an important role in maintaining internal security. ↑ Anthony H. Cordesman (2006). Arab-Israeli Military Forces in an Era of Asymmetric Wars. Greenwood Publishing Group. ISBN 0-275-99186-5. Retrieved 14 February 2011. ↑ Komarow, Steven (2005-03-29). "Tanks take a beating in Iraq". USA Today. Retrieved 2010-04-09. ↑ Komarow, Steven (2005-03-29). "Tanks adapted for urban fights they once avoided". USA Today. Retrieved 2010-04-09. ↑ Anthony H. Cordesman; Aram Nerguizian; Ionut C. Popescu (2008). Israel and Syria: The Military Balance and Prospects of War. ABC-CLIO. p. 99. ISBN 978-0-313-35520-2. Retrieved 1 April 2011. 1 2 3 4 Neville Brown (2009). The Geography of Human Conflict: Approaches to Survival. Sussex Academic Press. p. 254. ISBN 978-1-84519-169-6. Retrieved 5 April 2011. ↑ Stan Krasnoff (2008). A Claytons Defense. Strategic Book Publishing. p. 35. Retrieved 5 April 2011. ↑ Asia-Pacific Defence Reporter, Volume 30. Asia-Pacific Defence Publications. 2004. Retrieved 2 April 2011. ↑ Treaty on Conventional Armed Forces in Europe. Organization for Security and Co-operation in Europe. 1989. p. 3. Retrieved 4 April 2013. ↑ Stan Windass; Paul Walker (1985). Avoiding Nuclear War: Common Security as a Strategy for the Defence of the West. Brassey's Defence Publishers. p. 38. Retrieved 4 April 2011. 1 2 Richard Holmes; Hew Strachan; Chris Bellamy (2001). The Oxford Companion to Military History. Oxford University Press. pp. 493, 902. Retrieved 4 April 2011. ↑ ""Армата" расстреляет снаряды противника из пулемета". Retrieved 2015-05-22. ↑ "Танк Т-14 "Армата" или Т-99 "Приоритет" - Продукция - Библиотека - ВПК.name". vpk.name. Retrieved 2015-05-22. ↑ "БМП "Армата" сможет уничтожить вертолеты и беспилотники". Retrieved 2015-05-22. ↑ ""RPM "Cloak" to protect from exploration and precision weapons"". Nii Stali. niistali.ru. Retrieved 2015-05-22. ↑ "BUSINESS - Otokar mulls making of domestic 'electric tank'". Hurriet Daily News. Retrieved 2015-05-22. 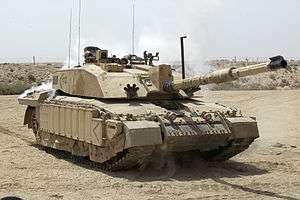 ↑ "Defence chiefs knew 'invincible' tank armour could be breached". Daily Mail. 24 April 2007. ↑ Sean Rayment (May 12, 2007). "MoD kept failure of best tank quiet". Sunday Telegraph. ↑ African armed forces journal. Military Publications Ltd. 1994. p. 10. ↑ Jeff Groman (1985). Weapons of War. Gallery Books. p. 126. Retrieved 18 February 2011. ↑ Thomas W. Zarzecki (2002). Arms Diffusion: The Spread of Military Innovations in the International System. Psychology Press. Retrieved 18 February 2011. ↑ National Research Council (U.S.). Committee on Adiabatic Diesel Technology (1987). A Review of the State of the Art and Projected Technology of Low Heat Rejection Engines: A Report. National Academies. p. 108. Retrieved 2 April 2011. ↑ Michael Chichester; John Wilkinson (1987). British Defence: A Blueprint for Reform. Brasseys Defence. p. 126. Retrieved 4 April 2011. ↑ Brian MacDonald (1997). Military Spending in Developing Countries: How Much Is Too Much?. McGill-Queen's Press - MQUP. p. 136. ISBN 0-88629-314-6. Retrieved 2 April 2011. ↑ Michael Green (2008). War Stories of the Tankers: American armoured Combat, 1918 to Today. Zenith Imprint. p. 281. ISBN 978-0-7603-3297-9. Retrieved 4 April 2011. ↑ David Miller (2000). The Illustrated Directory of Tanks of the World. Zenith Imprint. p. 384. ISBN 0-7603-0892-6. Retrieved 4 April 2011. ↑ David Eshel; Bill Sweetman (25 April 2011). "New Designs Suit Tanks For Asymmetric War". The McGraw-Hill Companies, Inc. Retrieved 3 May 2011. ↑ Saudi Arabia Enters the Twenty-first Century: The Military and International Security Dimensions. Greenwood Publishing Group. 2003. p. 140. Retrieved 1 April 2011. ↑ Stanley Sandler (2002). Ground Warfare: An International Encyclopedia, Volume 1. ABC-CLIO. p. 59. ISBN 1-57607-344-0. Retrieved 5 April 2011. ↑ United States. Congress. House. Committee on Appropriations (1990). Department of Defense Appropriations for 1991, Part 6. U. S. Govt. Print. Off. Retrieved 4 April 2011.